Three worrying pieces of legislation have being progressed through the house over the last few days and social justice and reason have being brashly cast aside in the process. Yesterday saw the Public Health and Disability Amendment Bill being passed through Parliament and while it was celebrated by the Government as positive, world leading legislation, there were very concerning elements. The bill was not initiated to put right a past injustice as Tony Ryall has spun it but to protect the Government from further claims and expenditure. A group that included Peter Atkinson and Cliff Robinson had won a long legal battle (costing the Government $1.4 million) to show that they had been discriminated against when the Ministry of Health had refused to pay them for caring for their disabled children or other close relatives. The court ruling obligated the Government to having to pay the many people who had chosen to forsake other paid work to become a caregiver of a family member. It had been estimated that the ruling may cost the Government hundreds of millions. The legislation limited payments to family caregivers to no more than forty hours a week and blocked any further legal action on the issue. The Government has refused to recognise that the cost of care in a home would probably be much cheaper than institutionalised care and limiting the payment to 40 hours will continue the financial hardship for family carers. The pay would be not at the same rate as other carers but will be set at the minimum wage. To also block further legal action is just blatant contravention of basic human rights. 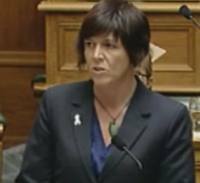 A passionate speech from Green MP Jan Logie emphasised the fact that despite the legal ruling in their favour, the bullying of family caregivers continues. The Court of Appeal actually found that the caregivers were supported by existing law and that it was the Government's policy that was at fault. The passing of this legislation was actually progressing law to support the bad policy. On Wednesday we saw the second reading of the Prohibition of Gang Insignia in Government Premises Bill. It is a populist bill to deal with gang intimidation and the visual threats that patches provide. The bill may be well intentioned and while it was supported by National MPs who had past careers in the police, it would be unworkable. Green and Labour MPs provided lots of evidence, including from expert submissions to the select committee, to show how there would be unintended negative consequences if the bill became law. David Clendon provided some well reasoned arguments and was immediately accused as being a gang supporter by National MPs. The bill passed the second reading and looks likely to succeed. The third bill being debated was the Crown Minerals Amendment Act 2013 Amendment Bill. The bill was needed to amend previous amendments because errors were discovered in the hastily progressed legislation. Gareth Hughes explained how the Government is opening vast areas for oil exploration and will be welcoming companies to drill without proof of financial security or technical expertise. Company insurance provisions will only cover a minimal amount of the potential costs of a major disaster and Maritime New Zealand does not have the capacity to deal with one anyway. The greater risks involved with deep sea drilling has been glossed over and by allowing potential "cowboys" into our waters the risks increase further. The Government has also decided to extend the law within the act that bans protests at sea. It has bizarrely extended the law, under urgency, to include the high seas beyond our exclusive economic zone and this would likely contravene international law. They are aware of the huge opposition to deep sea drilling and they want the power to stop any protest action. It seems such a long time ago when we had a Government that actually provided navy support for protest action against an environmental threat. These three bills have displayed this Government's arrogance, its blatant abuses of human rights and social justice, its ignorance of good process, its disregard for our environment and its total refusal to base law on evidence and independent advice. I am really concerned about how much more bad law will be passed before we can get a change of Government in 2014. Dirty Dairying and a Solution. Nanny State Gives Way to Big Daddy! Will the Budget Realistically Address Poverty?